Misplacing an iPhone is a fairly regular occurrence for many of us, maybe it slipped between the cushions on a couch, maybe you left it in another room, maybe it fell somewhere under the seats in the car, maybe it’s in the backyard, anything is possible. 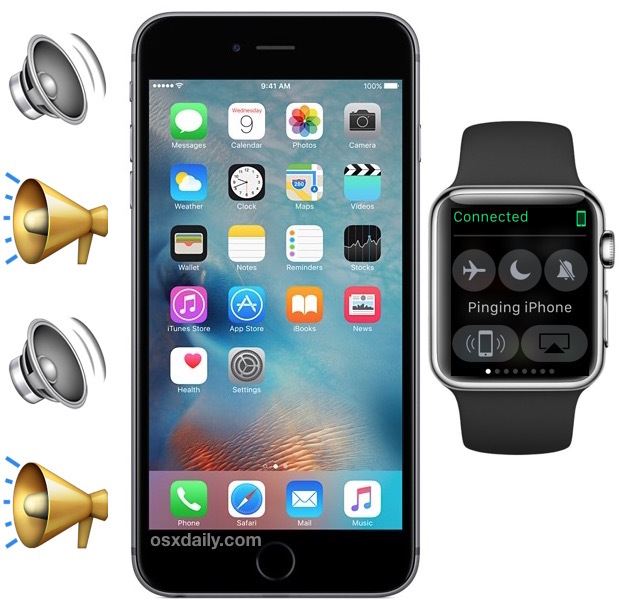 Fortunately for Apple Watch owners, they can use the handy Ping iPhone feature to make their paired iPhone emit a loud pinging sound, making it easy to locate a lost iPhone within earshot. The pinging iPhone feature is very useful, particularly for those of us who often place the iPhone somewhere and then forget where it exactly it went or where it fell to. Parents and sitters should find the feature to be helpful as well, since little ones have a knack for placing devices in unusual places, and being able to ping the iPhone to find it takes out much of the guess work. This works between the Apple Watch and the iPhone it is paired with, you can’t ping other devices that aren’t related and paired. As long as it’s nearby and connected to the Apple Watch, you can ping the iPhone and help locate it fairly quickly. The iPhone will let out a few very loud ping sounds, and you can keep pressing the pinging button to narrow down by the audio signal where the thing is located. If it sounds muffled, it’s probably stuck in a cushion or under a seat somewhere, or maybe it’s in the refrigerator, don’t rule anything out if the iPhone is missing! Another neat trick is a variation of the ping method, which causes the camera flash on the iPhone to blink in addition to the device sounding the normal dinging sound. The trick with this is to simply hold down the Ping button and the iPhone will both blink the camera flash in addition to making the chiming ping sound effect. This is great for finding a lost iPhone in a dark room, or if it’s stuck under a car seat or something similar. 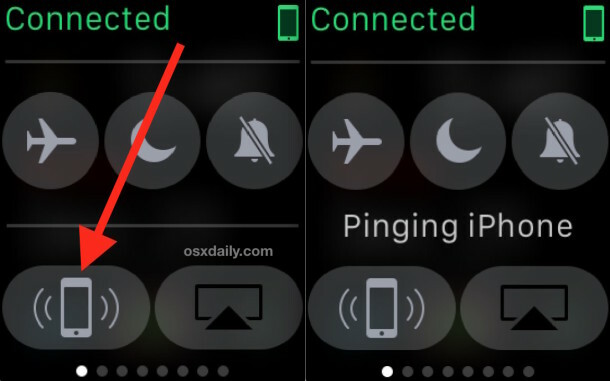 As mentioned before, if the Apple Watch shows a red ‘Disconnected’ message you won’t be able to ping the iPhone, and instead you’d need to rely on finding the lost iPhone with iCloud which can also ping a device and place it on a map, that method has the benefit of being accessible from another iOS device or web browser. If you’ve tried both iCloud and the Apple Watch and still can’t find the device, you’ll probably want to place it in lost mode with Remote Lock so that it’s unusable without your Apple ID. This is one of my favorite Apple Watch and iPhone features! I have used this to find a misplaced iPhone many times, usually it’s somewhere I left it and forgot about. Easy to be absent minded, ping it from the Apple Watch and you can hear the sound clearly, finding it in no time. Cool trick to be able to make the iPhone blink the light from the Apple Watch too! Maybe a future version could flash the screen as well, just in case it’s rear-down. Great feature and did not know about the flash option. 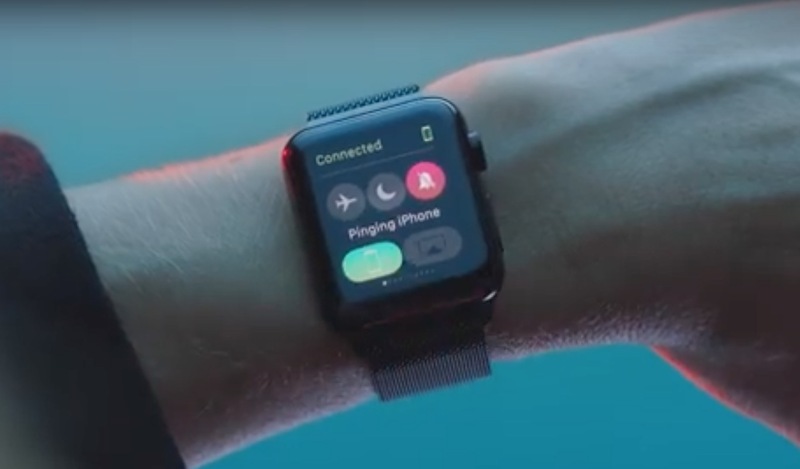 It would be good if the watch could let you know when you were just out of range of the iPhone to prevent leaving it behind, .e.g in the car or house. While a great tip, it’s somewhat frustrating to use because it only pings the iPhone ONCE. So you have to keep tapping the Watch phone icon as described above repeatedly to narrow down the search when the iPhone isn’t in the immediate vicinity. I wish it would ping at least 6-8 times so I could get close to it when it’s in another room in my house. Another great option is to use the music app on the apple watch Chose the iPhone, pick a song and the music will play continuously on the iPhone until you find it. They do not need to be nearby each other. Based on your info I spent several hours searching for my iPhone and it’s actually 90 miles away where I forgot it last night! Turns out they’re still connected over wifi.